Have you been diagnosed with Lyme disease? Do you find yourself feeling tired, deconditioned and unable to do the things you used to do? Hampton Physical Therapist’s may be able to help! and therefore difficult to treat. You may be wondering what role Physical therapy (PT) plays in LD? Research is beginning to demonstrate the potential benefits of a properly executed exercise program on decreasing the symptoms associated with LD. Physical therapy plays the greatest role when discussing the phenomena of “chronic Lyme disease”, “post Lyme disease syndrome” or “late Lyme disease.” Regardless of the title, these all refer to the chronic symptoms that occur after treatment for LD including fatigue, arthralgia, myalgia, depression, back pain and headaches just to name a few. In a cohort study out of Massachusetts, 34% of individuals with LD were found to have arthritis or recurrent arthralgias, neurocognitive impairment, and neuropathy or myelopathy a mean of 6 years after treatment for LD. In a similar study, 62% were found to have arthralgias, arthritis, and cardiac or neurologic involvement with or without fatigue 3 years after treatment (Cameron, 2010). The good news is, physical therapists are experts in treating many of these conditions! Physical therapists utilize a combination of manual therapy, modalities and an individualized exercise program to address a wide range of musculoskeletal and neurological conditions, many of which can occur following Lyme Disease. Research has shown that a properly executed exercise program can actually go beyond the antibiotics in helping to reduce symptoms and maintain a remission. Although there is currently a lack of decisive scientific evidence as to why exercise is beneficial for the Lyme population, several theories have been proposed. The Bb bacteria dies when exposed to even a small amount of oxygen. An intensive exercise program can increase tissue perfusion and therefore increase oxygen levels-which may help to kill off the Bb bacteria. Not only is Bb oxygen sensitive, it is also very heat sensitive. And guess what an intensive exercise program can also do, increase core body temperature to above 102 degrees! 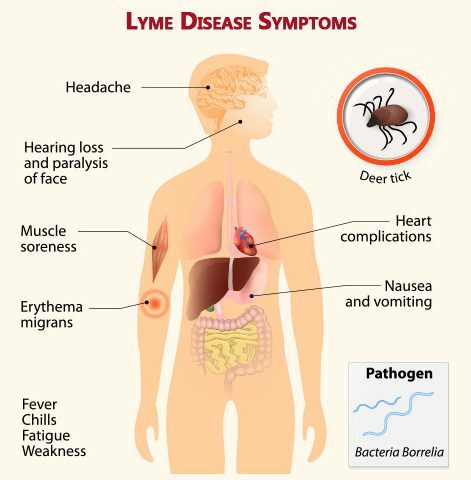 It has been proposed that the increased oxygen levels, the increased body temp, or most likely the combination of both weakens the Lyme bacteria and allows antibiotics and the body’s own defenses be more effective. And that’s not all! Regular exercise may benefit T-cell function and therefore increase the body’s immune system, which is often depressed by the Bb bacteria (Burrascano, 2008). As good as this may sound, it doesn’t mean you should go out and start an intense exercise program today. Lyme disease can impact the cardiac and nervous system and therefore place an individual at a greater risk for an adverse event. Individuals should be cleared by a physician before beginning an intense exercise program. It is also important to avoid exhaustion, which can lead to a decrease in immune function for up to 24 hours and place the individual at greater risk for remission or common co-infections to occur. This means a very gradual and appropriately progressed exercise program is critical, and the progression varies for each individual. Literature recommends that after a workout, an individual with LD should take a hot bath or shower and to try to nap to let the body heal. (Burrascano, 2008). So, why choose PT? Your physical therapist can create an individualized exercise program tailored to your lifestyle and exercise level to increase mobility, tone and strength while protecting damaged and weakened joints, tendons, and ligaments. Your physical therapist can then progress your program as appropriate while working with you to create a safe and effective home exercise program. Stop by Hampton Physical Therapy at either our Seabrook or Hampton NH clinics soon or give us a call to discuss how we can help you reach your goals and get back to a more active lifestyle! Burrascano, Joseph. (2008). Diagnostic hints and treatment guidelines for lyme and other tick borne illness. Advanced Topics in Lyme Disease, 16. Marques, Adriana. (2010) Lyme Disease: A Review. Current allergy and asthma reports, 10(1):13-20. Massarotti, E. (2002). Lyme Arthritis. Medical clinics of North America, 86(2):297-309.